The Emperor had two wives. Each had separate courts in the capital. Sei Shonagon, the waka poet and essayist of the eloquent and influential Pillow Book, was lady-in-waiting of the first Empress. The second Empress chose three ladies-in-waiting who were poetic diarists, including Murasaki Shikibu (b. 978), Izumi Shikibu (b. 974), and Fujiwara Takasue’s daughter (b. 1009). Lady Murasaki wrote the incomparable psychological novel, Tale of Genji as well as The Diary of Murasaki Shikibu, which reveals insight on her life while she was writing her novel. Izumi became a lady-in-waiting after she wrote the sensual Diary of Izumi Shikibu about her major lovers and their deaths. Lady Izumi’s love poetry is compared with the great waka poet Ono no Komachi (b. 834). Murasaki and Izumi were not related, instead Shikibu was the court title of their fathers. 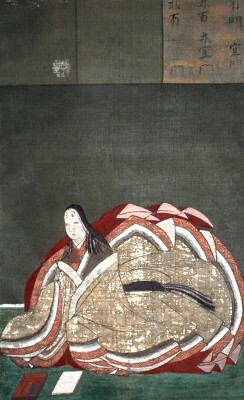 The third lady-in-waiting was Fujiwara Takasue’s daughter, also known as Lady Sarashina. She spent a short time at the second Empress’s court, but withdrew to read and write at home. She was the niece of the author of The Gossamer Years (Kagero Nikki). The following are three of the poets’ most famous waka included in the valuable collection of Hyakunin Isshu: One Hundred Poets. Poetic diaries continued to be written in the medieval, early modern, and modern periods of Japanese Literature with a combination of prose and tanka, but neither the quality not quantity of these have surpassed the diaries of Heian Period. It is strange and ironic that as influential and ground-breaking as the poetic diaries (or essays) of these women are, we do not know their full names. Each will always be associated with her father’s title or as the daughter, mother or aunt of someone else; yet in over one thousand years, their endeavors have not been forgotten. Arntzen Sonja (trans), “Sarashina DIary,” Haruo Shirane ed., Traditional Japanese Literature: An Anthology, Beginnings to 1600, New York: Columbia University Press, 2002. Keene, Donald. Seeds in the Heart: Japanese Literature from Earliest Times to the Late Sixteeth Century, New York:Henry Holt and Company, 1993. _____________. “Writing Like a Man: Poetic Literacy, Textual Property, and Gender in the Tosa DIary,” The Journal of Asian Studies, Anne Arbor, 2005, Vol. 64, Issue 1. Lowell, Amy. Introduction to Diaries of Court Ladies of Old Japan, Annie Sheply Omori and Kochi Doi (trans.) Boston: Houghton Mifflin Company, 1920. Minor, Earl and Robert H. Brower (trans.) Japanese Poetic Diaries. Berkley:University of California Press, 1969. Rimer, Thomas J. A Reader’s Guide to Japanese Literature. Tokyo: Kodansha International, 1999. Sterba, Carmen. “Historically Speaking: Heian Poetic Diaries,” Ribbons. Point Roberts, WA: Tanka Society of America, 2008, Vol. 4:4. Hyakunin Isshu 100 Poets: Passions of the Imperial Court. Tokyo: Pie Books, 2008. Intro: Kamakura is one of the jewels of Japan, surrounded by mountains and the sea. 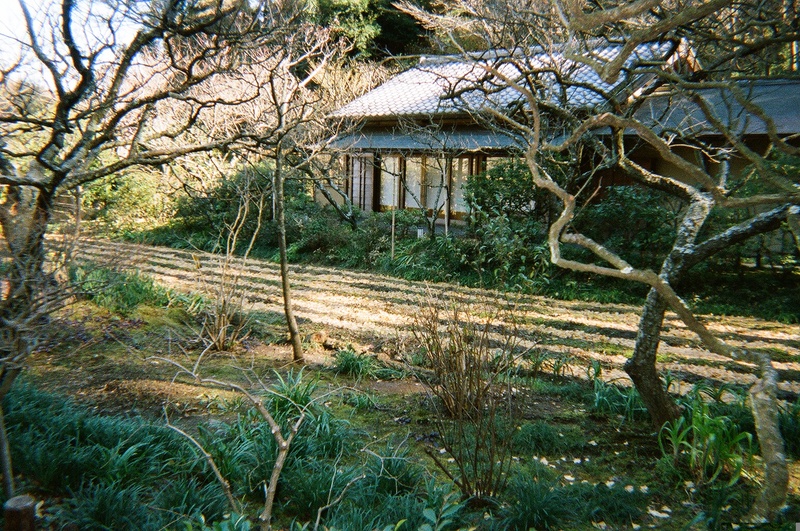 In a northern pine grove, a temple still stands that was founded by Kakusan Shido as a sanctuary for women in 1285. “A Safe Place to Run to” is haibun: a prose poem with haiku. It was published in a collection of haibun by Japanese and American women poets in The Moss at Tokeiji. Before nightfall, everyone eats a simple meal of rice and vegetable gruel. Hot barley tea is plentiful. Rozmus, Lidia and Sterba, Carmen (editors)The Moss at Tokeiji: A Sanctuary in Kamakura that Changed Women’s Lives 1285-1902. Santa Fe: Deep North Press, 2010. Fujitaka, who was a respected poet with the pen name Yusai was the only living person at that time who was in possession of the hand-written poetry commentary and concordance to decipher the 600 year-old Collection of Poems Ancient and Modern (Kokinshu). The possibility of Yusai’s death caused unprecedented concern about the secret teachings of the commentary for the first imperial anthology of waka poetry. Even the emperor heard about the predicament at Tanabe Castle. 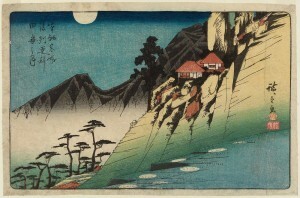 According to Museum Director Takeuchi Jun’ichi in the Lords of the Samurai: The Legacy of a Daimyo Family, “In the midst of defending the castle, Yusai negotiated to have a portion of the commentary sent with his poetry collection to a prince by a specially dispatched ‘armistice envoy.’” Soon after the prince handed the commentary to the emperor. It was most likely that these valuable possessions were transported in a wagon of oxen for the trip from the castle to the emperor in Kyoto with a bodyguard of samurai accompanying them. 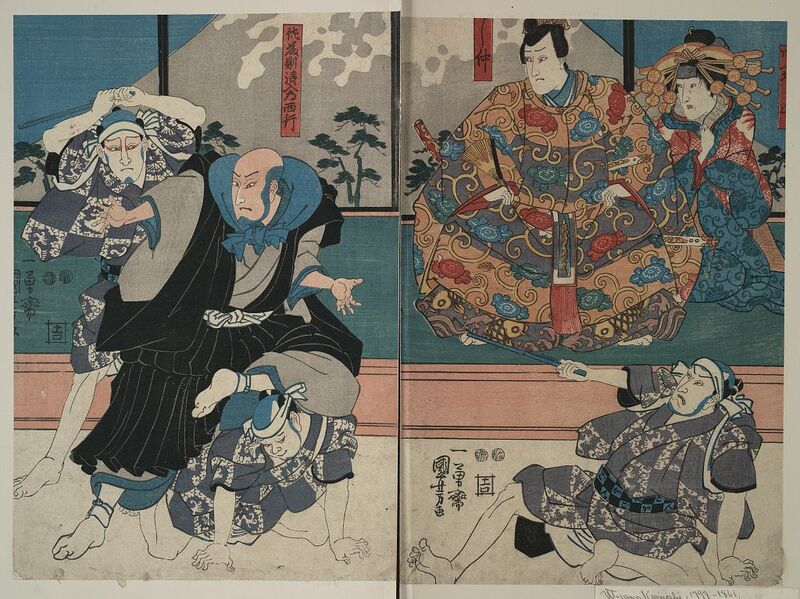 Next, the emperor asked Yusai to surrender his castle, but he refused. 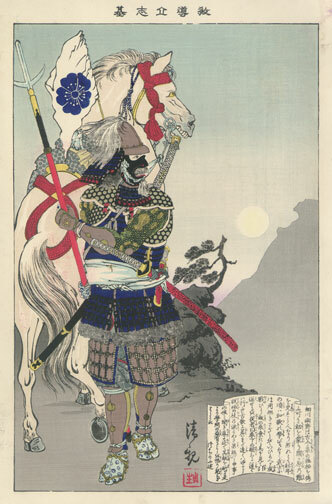 At the end of this incident, the emperor issued an edict for peace and the battle at Tanabe Castle ended. Tadaoki and Gracia’s son Tadatoshi followed in the footsteps of his grandfather and father and became proficient in the Tea Ceremony and performed in Noh Theater. He was also a connoisseur of paintings and invited the legendary swordsman and painter Miyamoto Musushi to retire at his home. All in all, the Hosokawa family has existed for 700 years. The 18th head of the family is former Prime Minister Hosokawa Morihiro, who is now a renowned as a ceramics specialist. The Hosokawa Family Collection at the Eisei-Bunko Museum in Tokyo, includes armor, swords, paintings, calligraphy, tea utensils, Noh robes and other art objects, but not the famed commentary that Yusai protected and bequeathed to a prince. Asian Art Museum of San Francisco. “Foreword: Warriors and the Literary Arts,” Lords of the Samurai: The Legacy of a Daimyo Family, San Francisco: Asian Art Museum – Chong-Moon Lee Center for Art and Culture, 2009. Sadler, A. L. The Maker of Modern Japan: The Life of Shogun Tokugawa Ieyasu, Tokyo, Japan: Charles E. Tuttle Company, 1937, 1986. Higuchi Ichiyo is a prominent author and poet who struggled with dire poverty and championed the poor. Over one-hundred years later, in 2004, she was chosen to grace the Japanese 5000 yen ($50) banknote. It was the third time a women had been chosen. 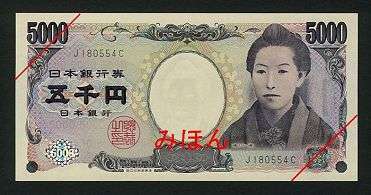 The other banknotes were the Empress Jingu (1881) and classic novelist Murasaki Shikibu (2000). Higuchi wrote about poverty-stricken men and women during the modernization of Tokyo at the end of the 1800s. One of her most famous novellas focuses on children who lived in the slums next to the “Pleasure Quarters” of Yoshiwara. Higuchi had been educated at the Haginoya Poetry Conservatory in Tokyo; thus, she possessed a good background in the classics such as Genji Monogatari (The Tales of Genji), and wrote tanka. Her family was from the samurai class that was swiftly becoming impoverished, for their stipends had been cut off. When her father died, she felt responsible to support her mother and sister, but few jobs were open to women and their funds soon disappeared. Furthermore, they left their middle class suburb for a poor area where she set up a store. When her former classmate, Miyake Kaho began to publish articles in literary magazines, Higuchi followed suit. “Besides her private struggles, Ichiyo’s prose diaries with tanka show her search for a new literary language that would do justice to everyday life in a Tokyo deeply involved in rapid Westernization and modernization,” according to Copeland. Though the literary community had embraced Western realism in novels, poetry and art, Higuchi did not read the newly translated Western literature, but continued to read Japanese literature in Tokyo’s Ueno Library where she discovered author Saikaku for the first time. Even though Saikaku’s characters were one-dimensional and his language and themes were often vulgar, she was inspired by his colloquial language, wit and verve, resulting in a kind of epiphany. She became able to appreciate the essence of what had made the Heian women poets great. it was not their style, but their “passion, frankness and honesty.” Higuchi found a way to reform her literary language into an earthy style and was liberated from imitating classical women’s styles. Higuchi is often introduced as the “Modern Murasaki” or “female Saikaku. Timothy Van Compornole has an apt description of Higuchi, “This frail, diminutive writer, who outwardly appeared dauntingly proper and conservative, whose demeanor suggested both wounded pride and a certain stodginess, and who was so soft-spoken before strangers as to be nearly inaudible, found a harder, more critical personal in her fiction, and used it to represent and give voice to marginal figures who might otherwise be socially invisible.” In spite of her poverty, she had the talent and independence to rise above her circumstances. Beautiful Midori is smart, innocent, but apprehensive about the future because her sister is already a courtesan in Yoshiwara; whereas Nobu is sensitive and introverted, the son of Buddhist priest; and tough Chokichi, who likes to bully Nobu, is the fire chief’s son. Higuchi’s prose diaries added with tanka brought back the days of the popular poetic diaries for Japanese women since their heydays in the early 10th and 11th centuries since this kind of literature dwindled during the middle ages and returned in the modern era of Meiji. Parts of her diaries, and complete novellas can be found in the Shade of Spring Leaves by Robert Lyons Danly. Unfortunately, she died of tuberculosis at 24 years of age. Copeland, Rebecca L. & Melek Ortabasi. The Modern Murasaki: Writings by Women of Meiji Japan, New York: Columbia University Press, 2006. Danly, Robert Lyons. In the Shade of Spring Leaves: The Life and Writings of Higuchi Ichiyo, A Woman of Letters in Meiji Japan, New Haven, CT, Yale University Press, 1981. Van Compernolle, Timothy J. The Uses of Memory: The Critique of Modernity in the Fiction of Higuchi Ichiyo, Cambridge, MA: Harvard University Asian Center Press, 2006.